Children's double-bill. 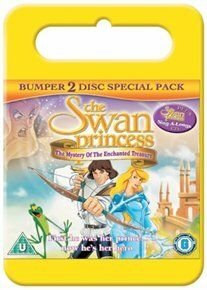 In 'The Swan Princess: Mystery of the Enchanted Kingdom', evil sorceress Zelda recruits the reluctant Whizzer, a strange-looking bird, to help her steal the magical Forbidden Arts from the castle in Swan Lake. They manage to obtain all but one of the original notes, so Zelda kidnaps Princess Odette, demanding that Prince Derek hands over the remaining one in return. 'Sing-Along' features songs from the 'Swan Princess' saga, including: 'Sing Along With Us', 'It Doesn't Get Any Better Than This', 'The Right Side', 'No More Mr Nice Guy', 'That's What You Do for a Friend', 'Practice, Practice, Practice', 'This Is My Idea', 'No Fear (Rap)', 'Princess On Parade', and 'Far Longer Than Forever'.